Ever wonder why Chinese food tastes SOOOO good? And no matter how hard you try you just can’t make it yourself as good as they do at a Chinese Restaurant. I’m pretty sure it has to do with all the oil and MSG they put in everything. 😉 So, when I had a Chinese food craving I decided we’d have to settle for second best and I’d make it at home…ordering Chinese is just not diet friendly (stay tuned for the slimmed down version in tomorrow’s post! ).When it comes to Chinese food, even items that seem like they might be “healthy” usually are not. Of course, some restaurants now offer healthy options, but let’s get real….if you’re going to order Chinese the last thing you’re thinking about is healthy….I mean if I wanted steamed broccoli, I’d just make it myself! So here is a recipe that is pretty close to being as good as the real thing. I always bake the chicken, but the original recipe calls for you to deep fry it. You definitely could fry it if you’re not being health-conscious, but personally I think baking it tastes much better. If you do want to fry it, be sure to add the flour with the first ingredients to make a wet badder, instead of dredging it in the flour, as is listed in my version. As for the rice, you can substitute pretty much any meat for the pork, but since I had left over pork loin, I used that. Chicken, bacon, and ham are all good alternatives. Also, you can add more or less vegetables to your preference. Fried rice is definitely the best way to use up leftover rice and if you have leftover meat it’s a double bonus. 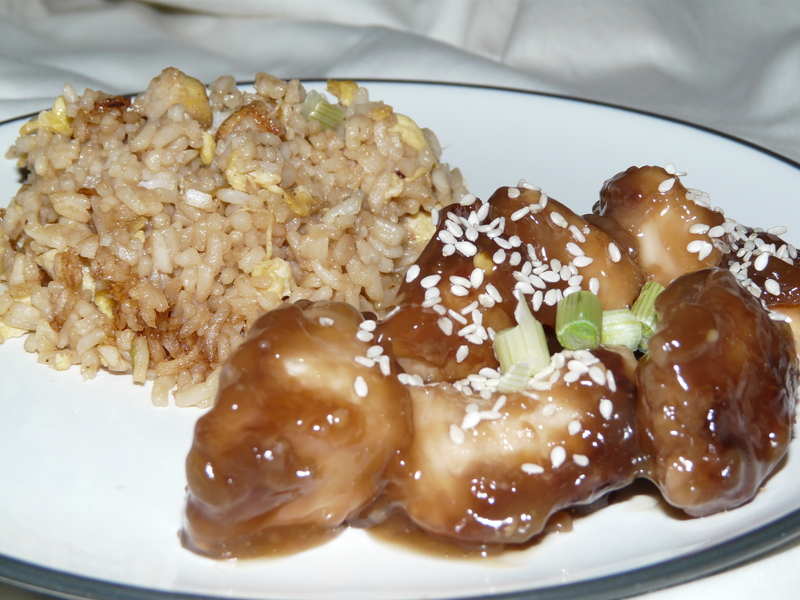 Of course if you don’t have leftovers and don’t feel like making the fried rice, this Sesame Chicken tastes great with plain white or brown rice, just pile the chicken and sauce on top! 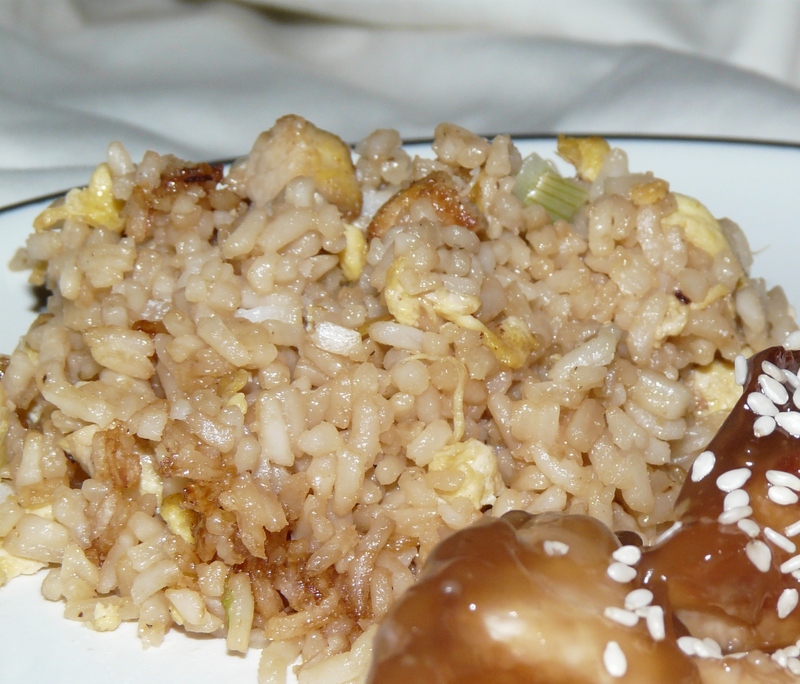 In a bowl, combine the soy sauce, vinegar, water and oil. Add the chicken to the bowl, making sure all the pieces are coated with the batter. Marinate in the refrigerator for at least 30 minutes. Place the flour in a shallow dish or bowl and dredge the chicken pieces coating all sides. Place chicken pieces on a baking sheet coated with non-stick cooking spray. Bake chicken at 350 degrees for about 10 minutes or until internal temperature reaches 180 degrees. Meanwhile, make the sauce by bringing the chicken stock, sugar, vinegar, soy sauce, sesame oil, pepper flakes, and garlic to a boil. Dissolve the 2 tbsp. of cornstarch into ¼ cup of water, and stir into the boiling sauce. Reduce heat to medium and simmer until sauce thickens and turns clear. Reduce heat to low and keep the sauce warm. Add the baked chicken pieces to the completed sauce and stir to coat. 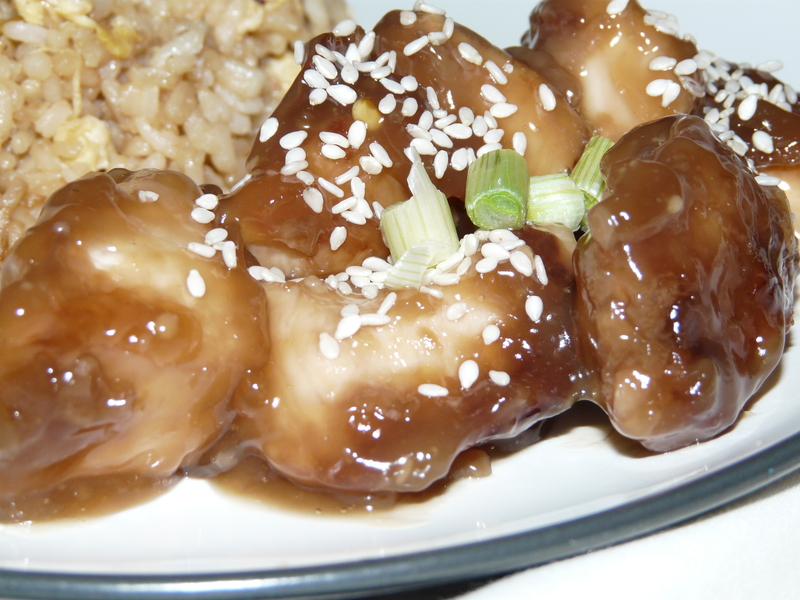 Serve chicken and sauce topped with the sesame seeds and scallions. ½ cup pork loin, cooked and chopped into small pieces. Add the pork and stir fry for 2-3 minutes or until heated through. Add the scallions and stir fry for another 1-2 minutes. Add the egg and stir until completely scrambled/cooked. Add the peas and stir fry for about 2 minutes until heated through. Add the rice to the pan, breaking up any clumps, and cook for a few minutes until heated through. Add the soy sauce and stir until well combined. Cook for another 1-2 minutes.